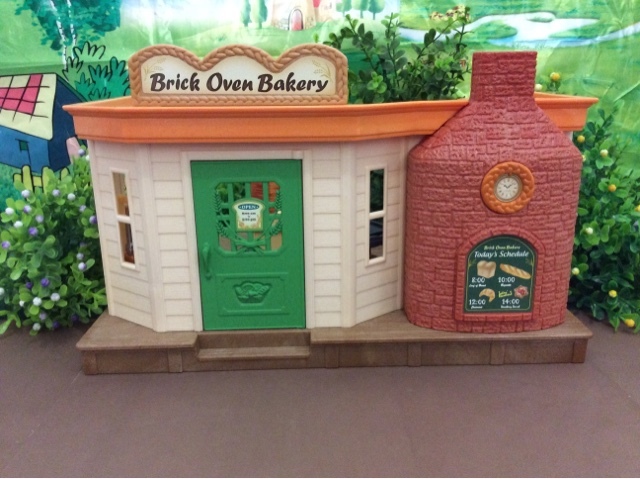 Recently I bought the new Brick Oven Bakery. I have been longing for a Bakery for my Honeybears since I got them. 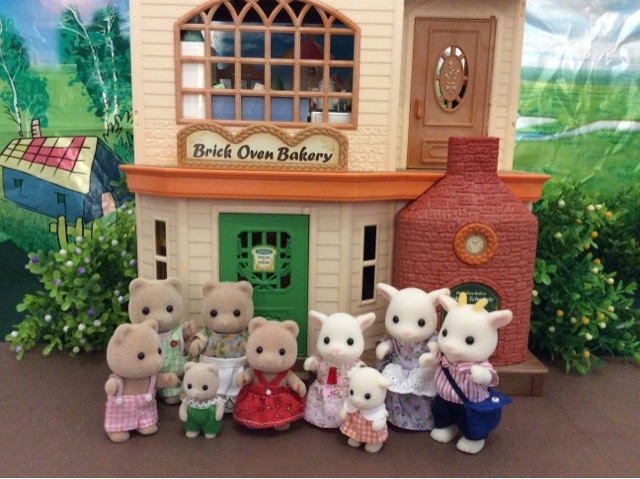 But at that time the Watermill bakery was out of stock in South Africa and then discontinued. A few times I came close to buying it on ebay, just to stop at the last moment. The postage was just always a tad to high. So last year when epoch released this bakery I was happy as can be. Even though it is not the Watermill bakery, this one is just as wonderful. The Honeybears live on top of their bakery in a Cedar Terrace which they share with new villagers, the Brightfield family. A side view, I really like the advertisement boards, very enticing. Like all the new buildings the sign is reversible BUT I just wish they included two stickers, then one don;t have to reverse it every time. Also I like the cute sticker detail on the door. This one says 'thank you'. Many of the shelves are 'built in'. 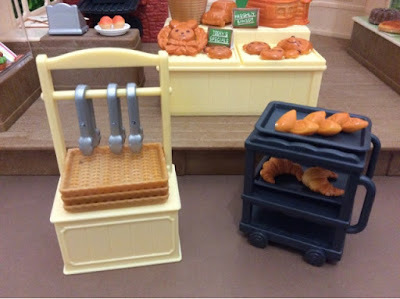 These two shelves and the trolley can be moved and arranged as one wishes. 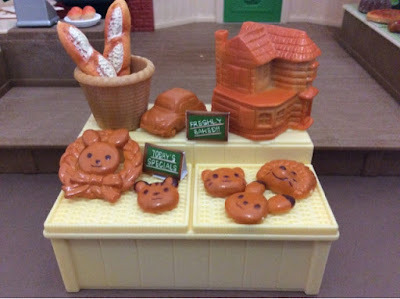 I decided to display all the cute items on this shelf. 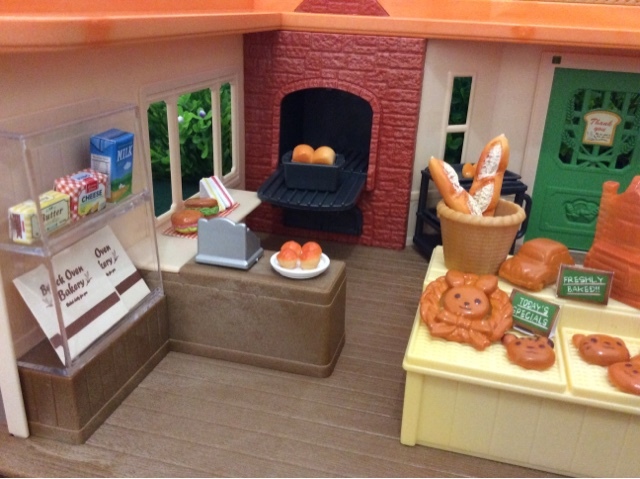 That house is amazing, and personally I like it more than the one that came with the Watermill bakery. The little car is quite cute too, and I'm glad they catered for the boys too. Isn't the hedgehog pastry sweet too! The shelf for the shopping basket is something special I like as well, but I am quite disappointed that the trolley's wheels can't roll. 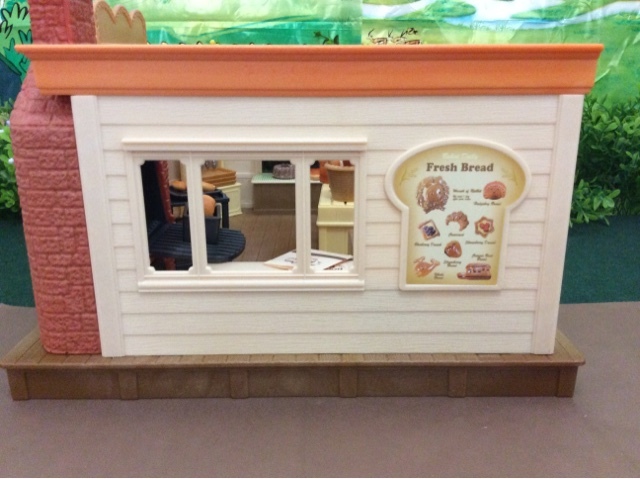 Left hand side - the pictures suggest that the "ready-made-sandwiches" be displayed in the unit on the left, but the open counter area behind the cash register looked too empty so I decided to display it there, and use the suggested shelf for the takeaway bread bags. 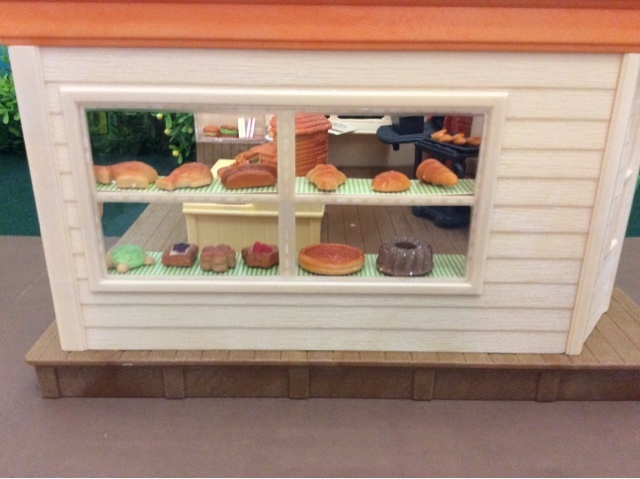 I also added the bowl with the "buns" next to the cash register. It just looked too empty. All and all a great addition to my collection. But there is three negatives for me... the trolley with the unmovable wheels, the sign should've come with two stickers AND in comparison with the Supermarket and even the Boutique the items for sale is just a little bit too few. It's wonderful and I bet that the Honeybears are thrilled:) Not a surprised that they could use more accessories, so typical. But overall it's great and I want one in the future. They are indeed thrilled, but I'm a little bit more for them. The orange is definitely better than the pink! Looks as if it smelled of fresh bread! Great review!. I love the accessories and the big display windows. The inside looks more spacious than the Watermill Bakery. So nice. 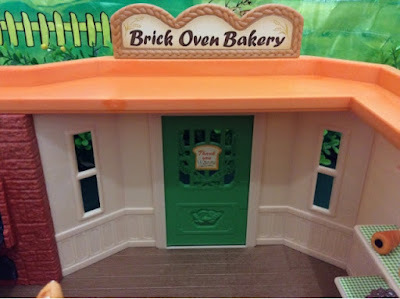 I didn't realize Cedar Terrace went on top of the Brick oven bakery. Looks so good together! 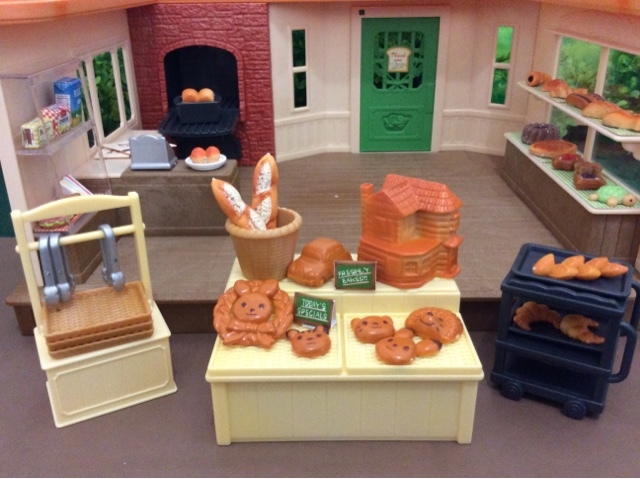 So many breads and baked items. Is that a Beechwood Hall bread/cake. How cute. I thought the whole time it did, and then I tried to find a picture of it and couldn't so I was very stressed for a while. But it does and that is just perfect. Yes it is Beechwood Hal! Lovely review, thank-you! 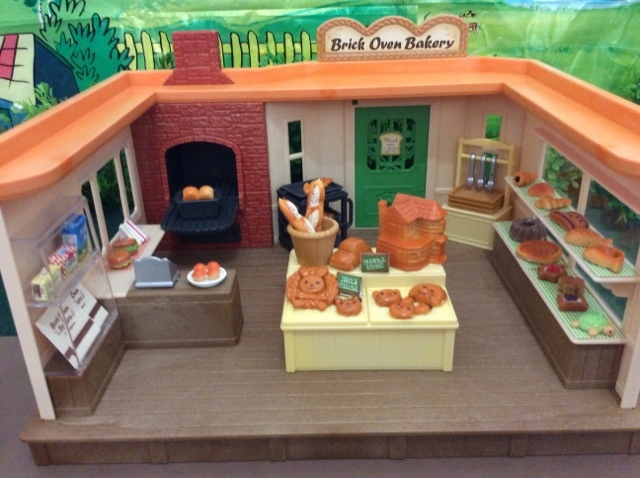 Even though I already have the Watermill bakery, I now want this one too! I agree with you the lovely pastries and breads like the house are even better than the ones with the Watermill bakery. 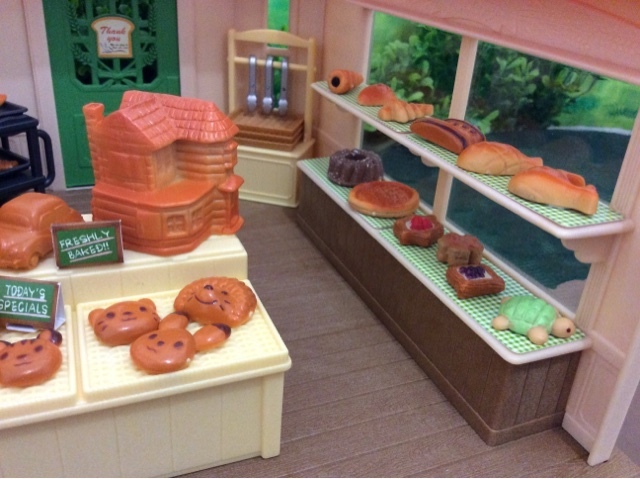 It is hard for me to compare as I haven't seen them in real life, but I am quite happy with the ones that came with this bakery. 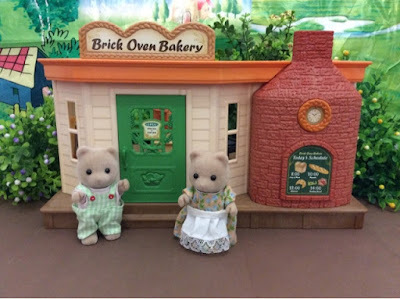 Thank you for this review and the photos! 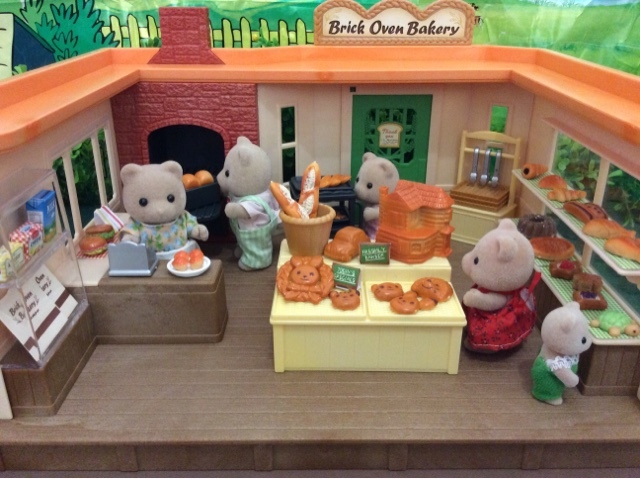 This bakery is really a nice one! I am impressed by the pastries! They look so nice! Thank you Jane, and so glad you are commenting again.